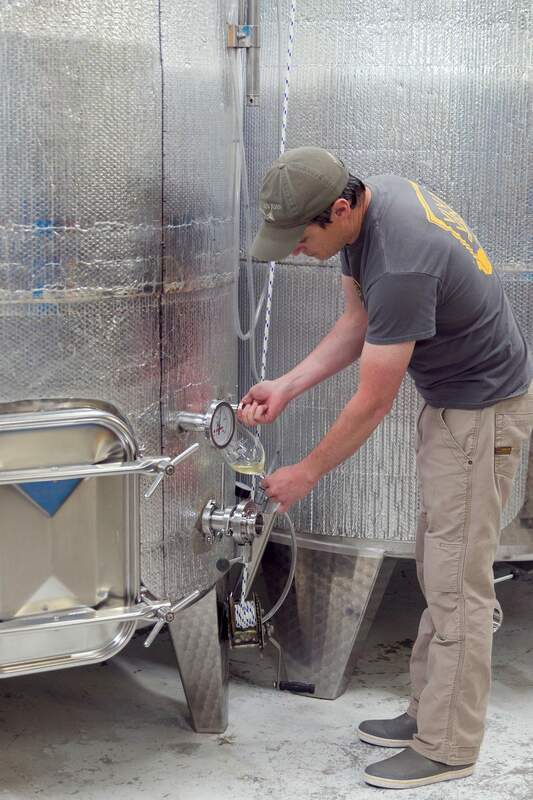 Joshua Arnold, winemaker at Wines of the San Juan, pulls wine from a steel tank at the winery in Turley, New Mexico. The winery’s 2014 Cabernet Sauvignon recently won Double Gold at the 2018 Finger Lakes International Wine Competition in New York. Marcia and David Arnold, Joshua’s parents, started Wines of the San Juan in 2001. Joshua says the winery’s first years were fraught with issues that affected the grapes, but they have since learned the ins and outs of viticulture in the San Juan Valley. 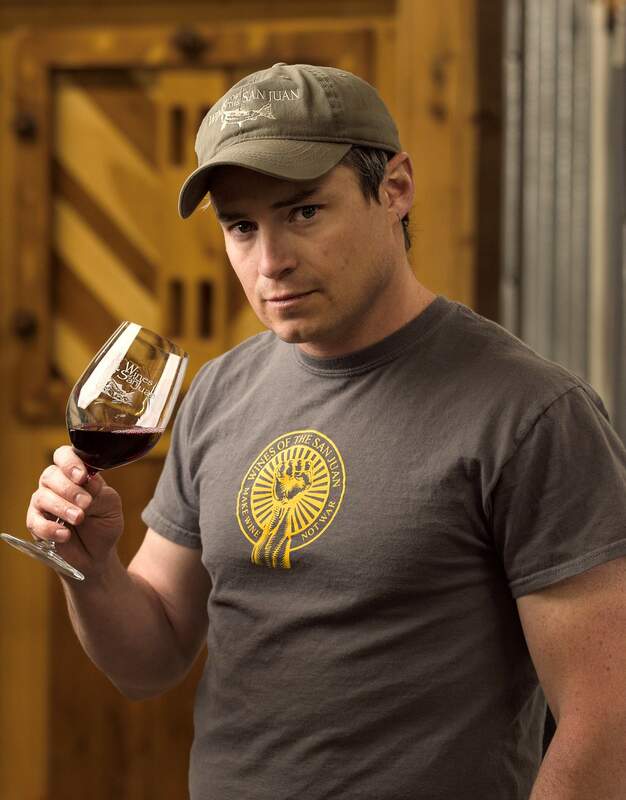 Joshua Arnold, who was raised in Durango, distributed wines for Wines of the San Juan before being promoted to winemaker in 2007. He advises that people enjoy wines simply, without getting too attached to the pomp and circumstance of associated with the beverage. Joshua is the youngest of five siblings and the second generation to take the reins as winemaker at Wines of the San Juan. 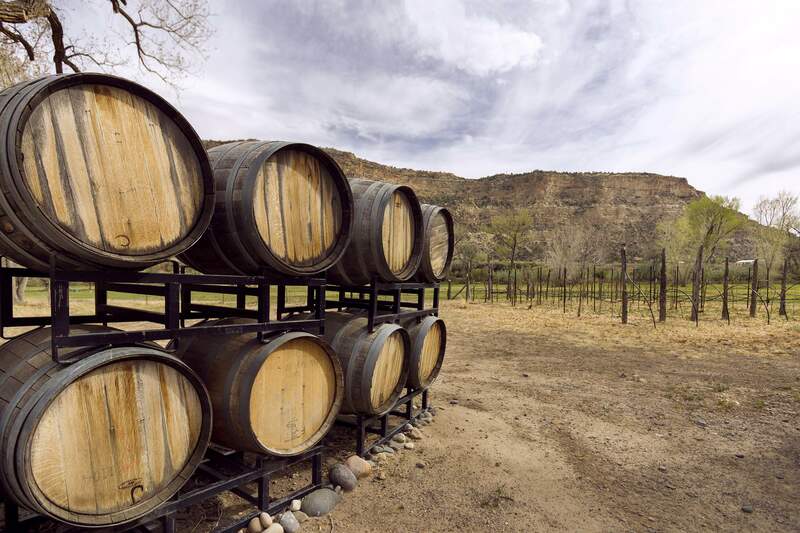 The vineyard, established by his mother and father, Marcia and David Arnold, in 2001, is located an hour south of Durango in Turley, New Mexico, nestled between the sandstone plateaus that outline the San Juan River Valley. Joshua’s demeanor is youthful. He’s married with two young kids. His wife, Brittny Arnold, keeps up with marketing and event planning for the vineyard while homeschooling their children. Both of Joshua’s ears are pierced, and for most of his life, he lived simply for the thrill of skiing in Colorado and Argentina. Grey hair shades the black tufts that protrude from below his ball cap betraying his age and perhaps lending insight into the difficulty of a vintner’s life in northern New Mexico. On weekends, Joshua used to help distribute wine to about 60 retailers throughout New Mexico. He also designed and crafted all of the labels and assisted his father with winemaking until 2007, when he was promoted to winemaker. His dad gave him the bull, as Joshua tells it. Making wine is more than a job, it becomes your life Brittny Arnold said. It’s a combination of ingenuity, dedication, science and magic. “I always laugh when people tell me that when they retire they want a little vineyard. If they only knew how much work went into making wine,” she said. It’s a good thing Marcia and David Arnold did not know how demanding and risky a venture making wine would be. Their story began on a dairy farm in Wisconsin, followed by a move to Durango for a fresh start. David managed Sunnyside Farms and produced alfalfa but, according to Joshua, they wanted something from life that would ultimately be more fulfilling. The idea for a vineyard came one day when a neighbor brought over a jug of homemade chokecherry wine. David began researching climate data, growing seasons and soil and thought to himself that since Farmington had a history of successful orchards, it would be well suited for growing grapes. Much to their chagrin, the family would soon experience wild temperature swings and two hard frosts – one in fall and one in spring that were nearly untenable wreaking havoc on their first crops of Vitis vinifera, traditional European grape varietals. It takes an average of three to four years before a vine will produce grapes for wine, and often it would be the third or fourth year that a hard winter, frost or disease like crown gall would destroy the family’s plants, recalls Brittny. The vineyard produces an average of 10 tons of white and red varieties per year and, as is common practice, the rest of the harvest comes from vineyards near Deming, New Mexico, and north of Santa Fe. Joshua Arnold field blends, or plants more than one varietal, for most of his harvest to produce a more complex and full body to his reds. He also has a small desktop laboratory to monitor oxygen, sulfites and acidity. He systematically alters storage temperature, oak chips and introduces different yeast strains to achieve high caliber and complex wines. Wines of the San Juan’s 2014 cabernet sauvignon won Double Gold at the 2018 Finger Lakes International Wine Competition in New York. More than 3,000 wines from 600 wineries and 16 countries went head to head. The 2011 Serendipity Merlot was awarded bronze and a host of their white wines took silver in the competition in 2016 and 2017. The Arnolds caution about becoming too attached to the pomp and circumstance often associated with wine. They advise simply enjoying oneself. Music, friends, atmosphere and sure, a crystal glass, are the key to appreciating the libation.